Witnessed Animal Cruelty? Don’t Just Stand There, Do Something! It’s incredibly hard for me to understand why anyone would intentionally hurt an innocent creature. With domesticated animals in particular so dependent on us humans for their care and wellbeing, why would any pet owner allow their animal to suffer or even worse, go out of their way to hurt them? Although conditions for companion animals have greatly improved in the last few decades, especially in western societies, there are still many people who view their pets the old-fashioned way – as property. They don’t recognize animals as sentient beings capable of having emotions and feeling pain, only as objects they have the right to do with as they wish. It has always dumbfounded me why would anyone leave their dog outside in the freezing cold or extreme heat without shelter (or even at all! ), let their injured or sick cat go without veterinary care, or allow their pets to starve. Personally, I think there’s a special place in hell reserved for the !&@$(%)#$* who abuse animals. Just like there are many people in this world who shouldn’t be allowed to have children, there are many people who shouldn’t be allowed to have pets. But unfortunately, our society doesn’t work that way. 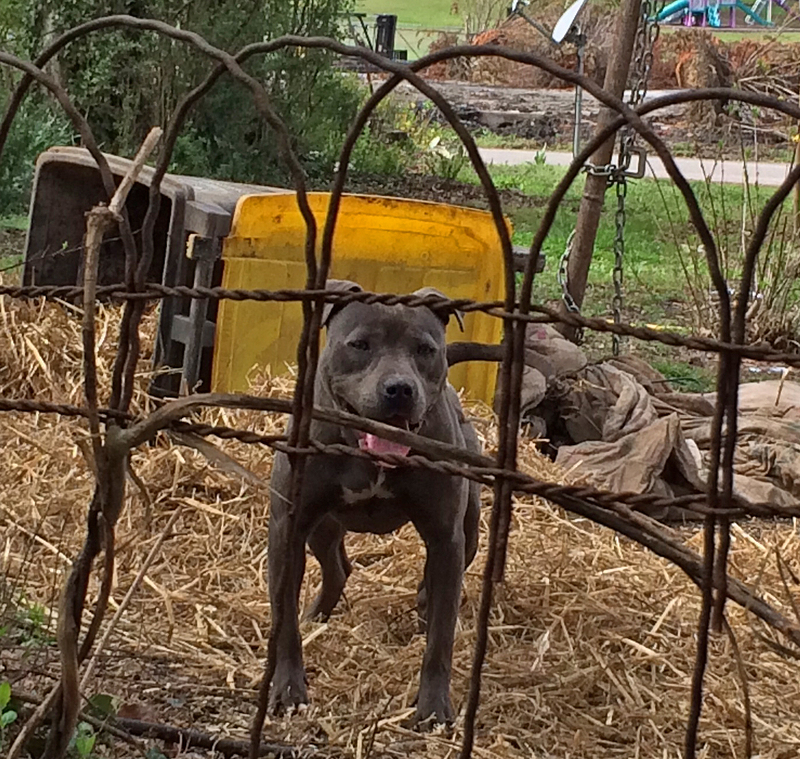 This pit bull has spent his entire life chained to a trash can, which his owner considers to be a suitable doghouse. That’s where we animal lovers come in. We sort of have to be the animal welfare watchdogs, making sure the losers and abusers of the world don’t get away with their crimes against non-human species. So in honor of Animal Cruelty Prevention Month, I thought I’d provide some tips about how to recognize animal cruelty and what to do about it. First of all, keep in mind that animal cruelty laws vary from state to state (all 50 states have them) and that every city or county will have different animal ordinances that spell out the legal versus illegal ways to treat an animal, so it’s important to understand what is or isn’t considered prosecutable animal cruelty in your community. For example, most caring people would never dream of leaving their dog outside on a tether 24 hours a day, seven days a week with little or no socialization, but in many cities and counties throughout the U.S. it’s still legal to do so. However, if that tethered dog is emaciated, with no food, water or shelter in sight, chances are that the owner is in violation and can be cited for animal cruelty. 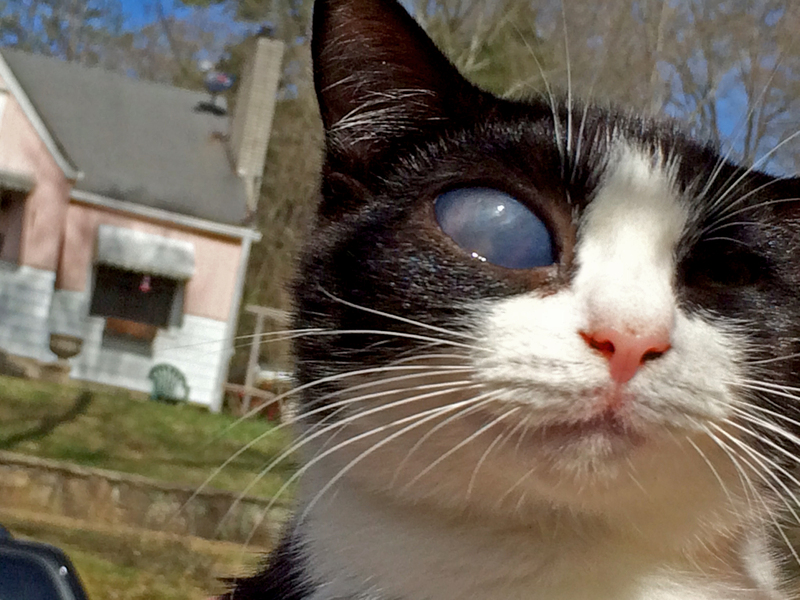 A kitten with an ulcerated eye, a very painful condition that was simply ignored by his owner. According to the Humane Society of the United States, animal cruelty comes in two forms – direct violence and neglect. 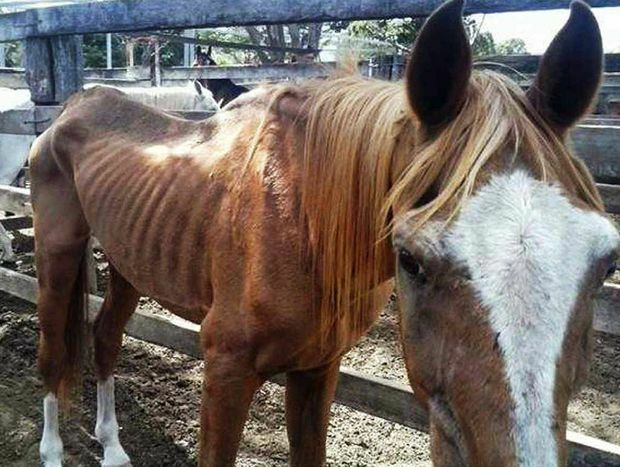 While direct violence is the most obvious, animal neglect is the most common. 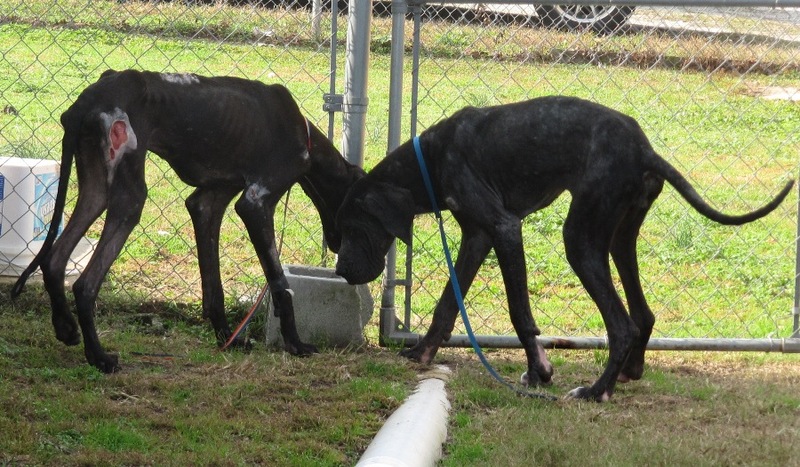 In fact, tons of animals die from neglect every year, right under the noses of the people in their communities. That’s why it’s important to educate yourself about how to identify animal cruelty when you see it. So you suspect an animal is being neglected or have observed it being abused – now what? Pick up the phone: If it’s an emergency situation, call 911, otherwise, call your local animal control or humane agency as soon as possible. Most large municipalities have an animal control department, animal shelter or humane society. If you don’t have an animal control in your area, call the police and report the situation. Relay exactly what you saw, give plenty of details and leave your contact information. You can ask to remain anonymous but do give dispatch a number they can call in case the investigating officer needs to ask you any questions. Confront the perpetrator (if it’s safe): This is very subjective, but if you feel comfortable and don’t think your life is in danger, speak to the person or have somebody else to go with you, just in case. If I saw my neighbor doing something horrible to an animal I would get my husband to go with me and confront that person, but that’s just me. Ultimately, most cases are best left to law enforcement. Be persistent and follow-up: If your local animal control or police department isn’t being responsive, call back and ask to speak to a supervisor. It’s important to keep in mind that most law enforcement agencies operate with limited personnel and resources and that most are probably doing their best to conduct timely and efficient investigations. However, if after repeated calls you’re still not getting the response you need, call your local news station – there’s nothing like bad publicity to inspire law enforcement to fix a problem! So an animal control officer has gone to the property to check on the animal – what happens next? Typically, an officer will investigate your complaint to see if any animal cruelty laws have been violated. If a violation has occurred, the officer may speak with the owner, issue a citation and give the person a chance to correct the violation. If the neglect or abuse is extreme, however, the officer will remove the animal and take it to the county shelter or humane agency where it can be protected from further harm. The agency will then present the case to the local prosecutor’s office for further evaluation and possible prosecution. Be prepared that you may be asked to testify about what you witnessed. Since animals can’t speak for themselves, human witnesses are crucial for building strong, prosecutable cruelty cases, so be willing and able to do your part, if possible. You can always follow-up on a case by contacting your local government records office and requesting this information in writing. Since cruelty cases are part of the public record, you’ll be able to access information including whether the case went to court, if the owner paid a fine and whether the conviction was a misdemeanor or a felony. Animals have no voice, so it is our obligation and duty to speak for them, especially when they’re being mistreated. We will only be able to combat animal cruelty if all of us are vigilant and willing to take a stand, so if you witness or suspect animal abuse, don’t just stand there or walk away – report it. Your call may be the only chance that animal has to find help and possibly be rescued from a miserable or life-threatening situation. Animal cruelty is a crime, and the more often abusive individuals are punished for this behavior, the less likely others will be inclined to do the same. So if you see an animal in distress, don’t just assume someone else will take care of the situation – take action! For great tips on how to prevent animal cruelty, check out the ASPCA’s Fight Cruelty web page. 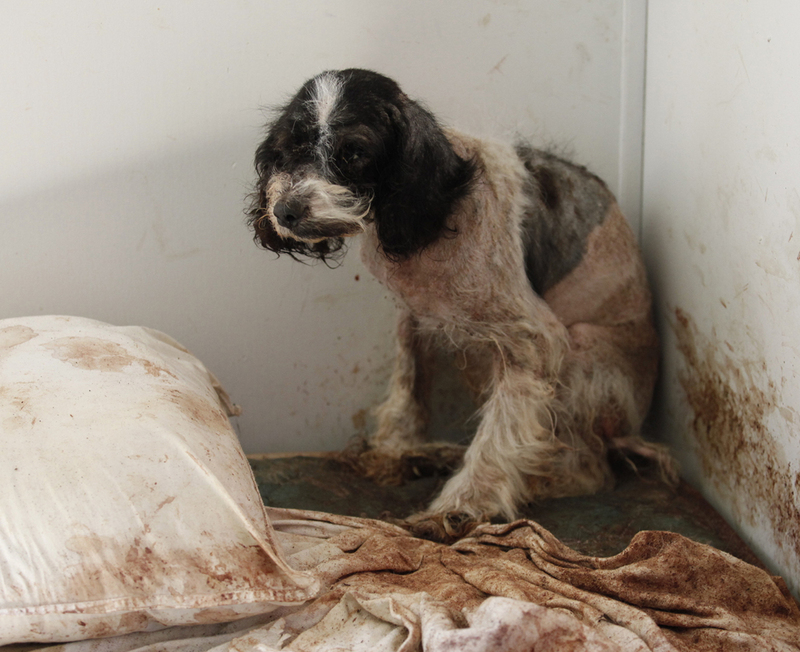 This entry was tagged animal cruelty, animal welfare, dog rescue, pet rescue. Bookmark the permalink.